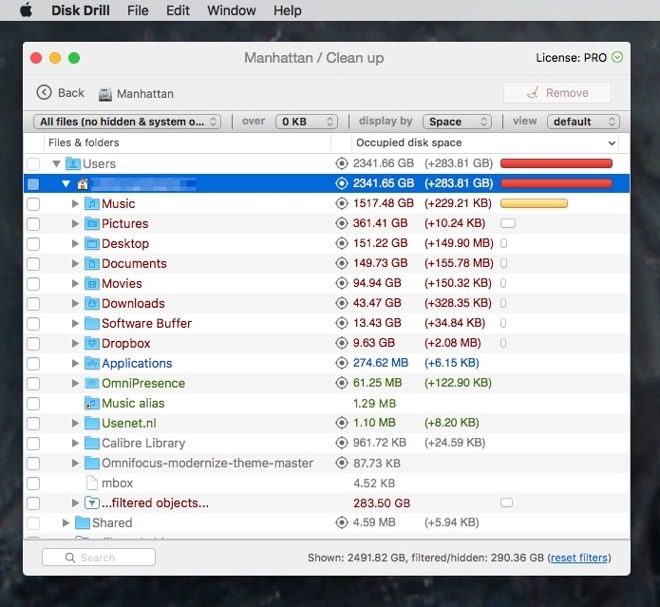 If you don't have a good backup of your Mac, and as a result have lost something important, Disk Drill 3 aims to restore what's gone and try to protect you against future problems. AppleInsider offers a closer look. The best of us make mistakes and delete documents or files that we really wish we hadn't. Usually the answer is to restore them from your backup, but it's still possible for them to slip through the cracks. When they do, you may well be out of luck —but if you lost it on a hard disk, you may have a chance with recovery tools like Disk Drill 3.1.769. Most of the time when a document goes missing, it's down to finger trouble: you pressed delete when you didn't mean to. We're going to be stuck with bad decisions forever, but what we're surely going to shed soon is the brilliant but rickety hard disk. Every hard disk goes wrong with small flaws or eventually total failure. When Solid State Drives with no moving parts can be made big enough and cheap enough, the hard disk is history. Until then, tools like Disk Drill are good for both hard disk failures and distracted fingers. But, Disk Drill is probably not directly of use to you if you have an SSD. Why this is, is a discussion for another day. However, regardless of drive choice, no disk recovery app is guaranteed to get absolutely anything back for you. If any other category of software had the success rate of a data recovery tool you'd be asking for refunds. Yet because they can be your only possible hope and because they can save the day at least sometimes, tools like Disk Drill are worth the money. You're aware that absolutely everything you do on your Mac involves your hard disk in some way. Even if you aren't personally saving documents to the drive, Safari is keeping a copy of something. Word is writing interminable temporary files so that it can recover the documents it destroys for you. All data recovery relies on one fact. When you or your computer deletes a file, it doesn't really get out a pencil eraser and scrub away at it all on a hard drive —and this is related to why the app doesn't work so well on a SSD. Usually, though, for speed, it just lists the space that file took up as now being empty. So the next time you or your computer needs to save something, that empty space is fair game. Once something else has been saved in the space, your old document is gone. If writing an email or opening a web page can be enough to have a new file written to your disk, downloading an app like Disk Drill definitely can. So the makers recommend that you download it now, before you lose anything. They would say that, they want your money. Still, they do have a point and moreover the app is free to download to see if you can save anything. 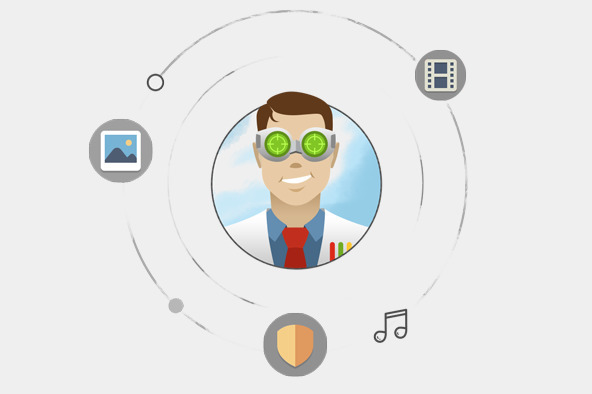 You can use this basic, free app for two things: monitoring the health of your hard disk and seeing if anything lost can be recovered. If you're in luck, and some files can be recovered, unlocking these Pro features costs $89. Running the search for recoverable items is quick to start and on a 3 TB drive took us around four minutes. Once you've got the list, you can click on a lost file and recover it. Nicely, though, you can also also click a button to have every single recoverable file be mounted as if they were on a separate hard disk. Then you can open that disk image and drag out whatever you need. Sometimes you will need to do this because it's not always clear what documents have been recovered. Very large files are unlikely to have been saved in one single spot on your drive, they will have been broken up into chunks. When that happens, you may find Disk Drill has recovered all the chunks as separate files. With everything on this disk image, it's smart, quick and easier to understand to find and recover these chunks. You might have to do some work stitching the bits back together but count yourself lucky that you've got them back at all. Since it's only our most important data that we care about when we lose it, any time you recover something it feels like the most gigantic relief. This relief is then followed by a vow that you will backup properly in the future. 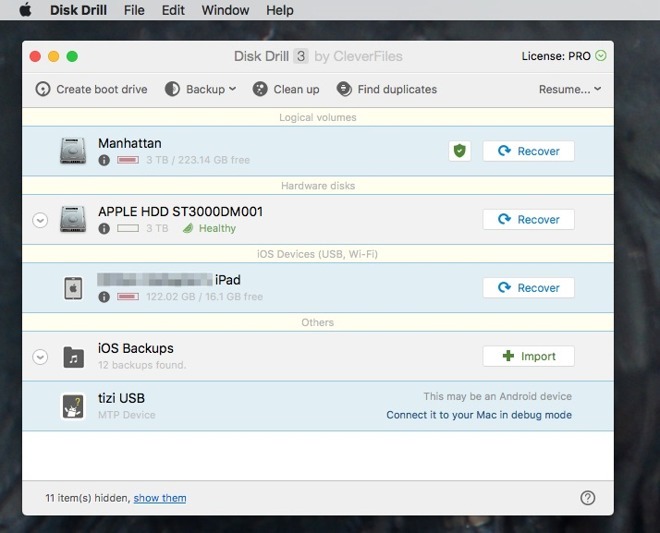 Before you forget to do that, you can use the free version of Disk Drill to keep an eye on your hard drive state. It won't protect you from finger trouble but it will tip you off that something is up with your drive. A menubar app reads from the drive's own SMART data and displays basic status information. Then the main DIsk Drill window where you search for files also says whether your drive is healthy or has problems. That screenshot includes all the physical hard drives connected to an iMac but also iOS ones. In theory Disk Drill can help you with recovering lost data from your iPhones and iPads but in practice it's necessarily a token effort. The makers point out that what it really does is work on recovering any backup files that iTunes saves to your Mac hard disk which you may then have deleted. If you never backup via iTunes - because you use iCloud backup instead - then there are no files so there's nothing Disk Drill can do. More, if you do backup your iOS devices to iTunes, that still might not mean you're in luck. Apple Mail messages, for instance, won't be saved to that backup. Still, a minute ago you didn't have much of a chance, so it's better to have Disk Drill than not. That's as true for Mac hard disks as it is for iOS and as sales pitches go, you might as well get it because it's free isn't exactly compelling. It's true, though, and if it helps you avoid deleting something or helps you get some things back, it's worth the cost of the Pro version. 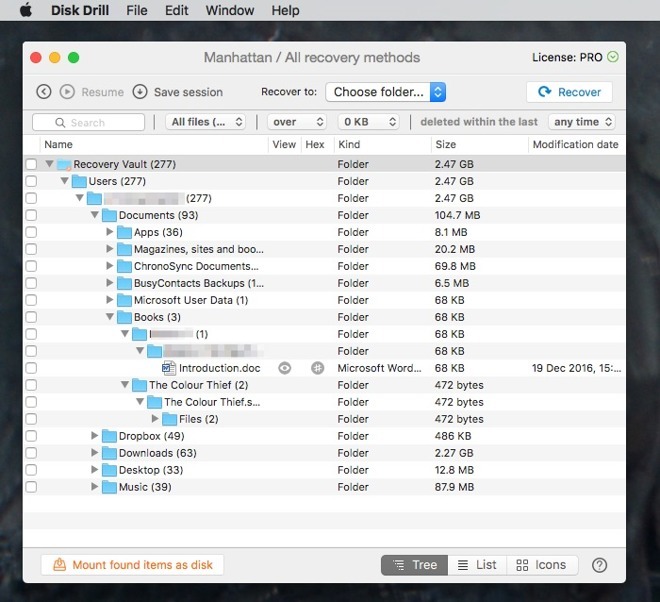 Disk Drill 3 Pro costs $89 from the maker's website.